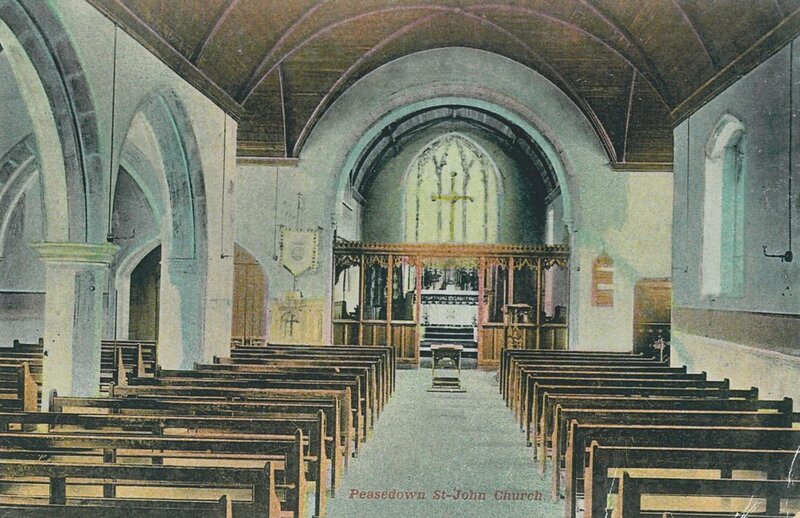 The district of Peasedown St John Baptist, Peasedown was formed in August 1874 by the Ecclesiastical Commissioners from adjacent portions of the three Parishes of Camerton, Dunkerton and Wellow. A temporary Church was funded by the Misses Jarrett of Camerton Court and the endowment was provided by them, with assistance from the Vicar of Wellow, the Revd G W Horton. Added to this was an annual grant of £50 from the Church Building Commissioners. The Church was fitted up by a Mr Butterfield and licensed for Divine Service and for the celebration of marriages. It consisted of a chancel, nave and a central turret containing one bell. There were 250 sittings. The register dates from 1874. The living was a perpetual curacy with a net yearly value of £150 in the gift of the Misses Jarrett. In 1880 the Church was enlarged to cater for the growing population of the village which at this time was around 1400. The Misses Jarrett also funded schools built near the Church and provided a parsonage house which was erected in 1878. The Church was dismantled in 1893 and re-erected as the Church of St John the Divine in Fishponds, Bristol. The present Church was built in 1892-93 at a cost of £2000. Built of Bath ashlar stone in the Early English style from designs by Messrs Bodley and Garner, architects of London. The organ, which was made in 1875 by W C Vowles, was transferred from the original Church. The ground for the Church and Churchyard was granted by Misses A & E Jarrett who also contributed to the building fund. The parsonage house with one acre of ground was made over to the Ecclesiastical Commissioners for the benefit of the Parish by Miss E Jarrett in 1896. The new Church was consecrated on Saturday 24th June, 1893 by Bishop Bronby, officiating for the Bishop of the Diocese. The village was gaily decorated in honour of the occasion, with several arches spanning the road and a large attendance of parishioners. All the neighbouring clergy were present together with a choir from Camerton. A public luncheon followed the service, held in the schoolroom and presided over by the Bishop. It is interesting to note that the original High Altar frontal was made from the wedding dress of the mother of the Misses Jarrett. The trowel used by Miss Jarrett to lay the foundation stone, together with this altar frontal, are both in the possession of the Church.The Church was extended about 1905 when the North Aisle was added, and about this time the heating pipe system was installed to replace a warm air system. It was extended in 1938. The Font dates from around 1912, erected in memory of the Revd Gamlen, who was Vicar when the Church was built. The Churchyard was extended in 1918 and consecrated on Easter Monday. Always involved in village life, there was a Church Poor Fund in being for many years to help in alleviating distress during the hard times of the miners’ stoppages. In 1928 the memorial was erected in the Church to the fallen of the First World War. There are two war graves from this conflict in the Churchyard. Gas lighting was in use up until August 1939 when the electric lighting was installed and entries in the Church Council minute book indicate the purchasing of carbide. The 50th Anniversary of the consecration of the Church was celebrated in 1943 with the presence of the Rt Revd Edmund Sara, Assistant Bishop of the Diocese who was vested in cope and mitre. It is interesting to note that one of the choirmen at this service, Mr George Gay, had been a chorister at the consecration of the Church and before that had sung in the original. The memorial to the fallen of the Second World War was unveiled on Sunday 5th July 1953 by Brigadier Cazenove and dedicated by the Bishop of Taunton, the Rt Revd H Thomas. During 1956 the organ was overhauled and restored. The Rood Screen figures were installed and dedicated by the Rt Revd F M E Jackson, Assistant Bishop of Bath & Wells on 4th September, 1960. The figures have been carved in Japanese Oak by Bath craftsmanRalph Keevil, and paid for entirely by donations and appeals at Baptisms and Weddings. The High Altar Reredos depicting the Nativity of our Lord was designed locally and made in ; it was dedicated on Whit Sunday 1977. During 1988 repairs were deemed necessary to the Church and a survey was carried out by Alan & Ann Thomas of Wells, Chartered Architects. A specification for refurbishment was issued and work commenced in the Autumn of 1989 by Plummer & Hockey. Shortly after work commenced with scaffolding in place and corrugated sheeting around the Church, a violent storm and gale occurred on the night of Friday 27th October. This did a lot of damage with scaffolding and sheeting scattered around the Churchyard. The interior of the Church was flooded. Another storm in February 1990 interrupted the work again. During the period of restoration Church services were held in the Church Hall. The Church re-opened for services on 1st April, 1990. The Bishop of Bath and Wells, the Rt Revd J L Thompson, visited the parish for the Centenary celebrations on 20th June, 1993. The Bishop dedicated the newly reinstated Churchyard Arch and Light. It is an exact copy of the original arch and light which was removed for munitions during the war years. Peasedown St John is one of the largest villages in Somerset, England, lying on one of the many hills outside of Bath, roughly 7 km south-southwest of Bath and 20 km southeast of Bristol. The A367 (which follows the route of the Roman Fosse Way) between Lincoln and Exeter used to run through Peasedown, but it was bypassed in the mid 1990s. Archaeological and documentary evidence suggests that Peasedown St John had been occupied continuously since the early Iron Age. 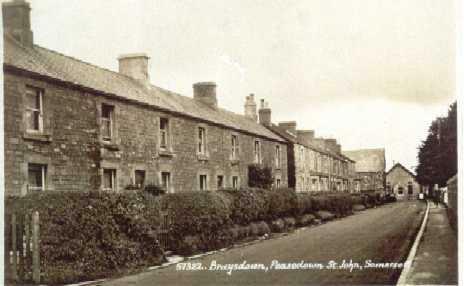 There is evidence of Roman and Saxon villages in Peasedown St John, the Saxon settlements resulting in several entries in the Domesday Book of 1086. The small hamlet of Carlingcott is believed to have existed before the 1800s the modern developments began in the 19th century when the Somerset coalfield was expanded as the Industrial Revolution increased demand for coal across England. The sinking of the Braysdown colliery in 1845 allowed for the village to expand. By the second half of the 20th century there were at least six collieries within 3 km of Peasedown St John evidence of these mines can still be seen today around the area. 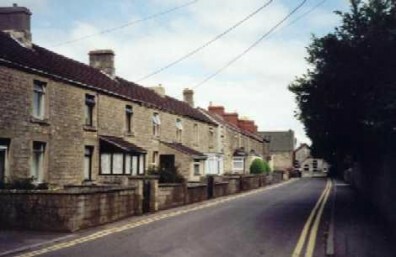 With the closure of the coal mines in the 1950s, and the popularity of people living out of town, Peasedown became a commuter village for the cities of Bath and Bristol. This enabled two further phases of construction, the first in the 1950s and 1960s and the second in the late 1990s and early 2000s. Both involved the construction of affordable family housing, the first phase being mainly in the southeast of the village and consisting of terraced or semi-detached properties. The second and more recent phase was the construction of a large number of detached and semi-detached houses. Peasedown St John is well known for its 6,000 residents, most of whom have lived in the village for many years, but there was one noteable person who lived in the village he was called Peter Alexander (born 1952) actor who played Phil Pearce in Emmerdale Farm, and he also appeared in Eastenders, Hollyoaks, Brookside and Coronation Street, he spent the first seven years of his life in Peasedown. Braysdown in the 1990’s- not much has changed today.